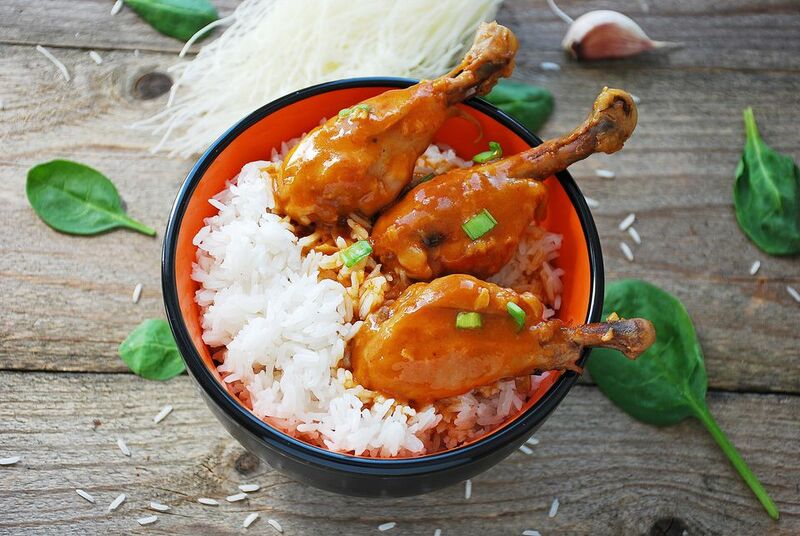 This recipe is for a whole orange chicken cooked in the crockpot, not an Asian-style dish. The chicken is flavored with oranges, sweet onion, and an allspice compound butter spread between the skin and the flesh. This helps keep the white meat moist. Place the whole chicken in the with little preparation and forget about it until dinnertime if you can ignore the scrumptious aroma. Instructions are also given for cooking this chicken in the oven. Rinse and drain the chicken. Pat dry with paper towels. Run your fingers under the skin of the breast meat and down the top of the legs to loosen the skin. Remove the zest from the orange with a peeler or a zester. Set the orange flesh aside. Combine the orange zest, butter, and allspice into a compound butter. Use your fingers to push this orange compound butter evenly under the breast skin and down the legs. Slice half of the orange flesh and half of the sweet onion, placing the slices on the bottom of the crockpot. Coarsely chop the remaining halves of the orange and onion. Stuff these pieces into the cavity of the chicken and tie legs together. Whisk together paprika, brown sugar, salt, and pepper. Sprinkle the spice mix evenly over the skin of the entire chicken. Place chicken, breast-side up, in the crockpot on top of the orange and onion slices. Cover and cook on Low for 4 to 6 hours. The cooking time will depend upon your particular type of crockpot. Newer models heat up faster and cook at a higher temperature so that cooking time will be less. It is difficult to achieve a nice browning of the skin in a crockpot. You may wish to place the cooked chicken under the broiler for 4 to 5 minutes to enhance the coloring. Let the chicken rest 15 minutes before carving to serve. To cook with an oven, proceed as above, but use a foil-lined, deep-sided roasting pan. Cook in a preheated 375 F. oven for 1 hour, until golden. A meat thermometer inserted between the thigh and breast, not touching bone, should read 165 F. Let the chicken rest 15 minutes before carving to serve.